A collaborative blog post written by Gavin Hays and myself. Is our education system ‘Finnish’? 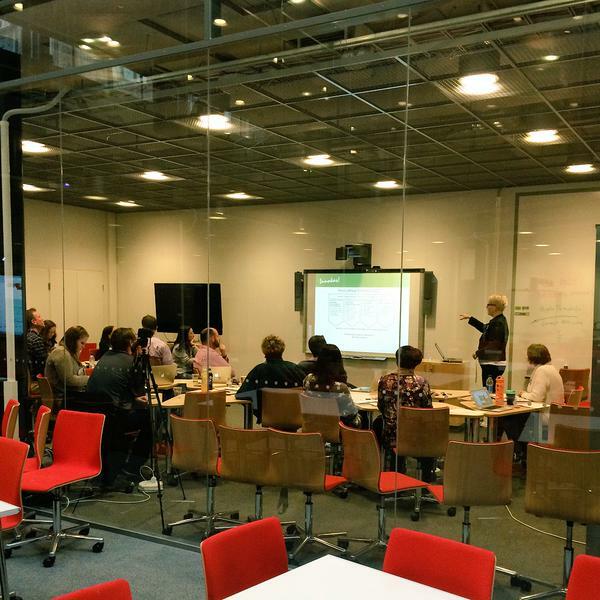 Recently, we were given the opportunity to travel to Finland to participate in the ‘Global Education Community’ conference facilitated by the Innokas Network within the University of Helsinki. The conference focus was to provide the opportunity to make global connections with teachers in Finland, China and the USA. 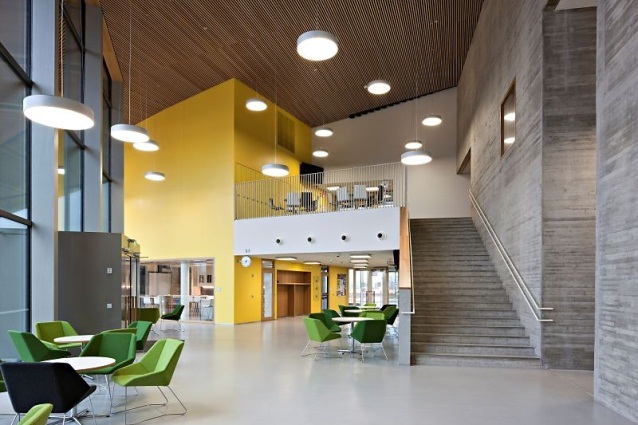 Additionally, we were able to visit Saunalahti School, Mantymaki Elementary School and Helsingin Normaalilyseo High School to see the sense of community and personalised learning that is in alignment with the national objectives for Education in Finland. Finally, we were given a first hand insight into the reasons for the success of the Finnish Education System by Jari Lavonen (Head of the Department of Teacher Education) and Paula Mattila (Counselor of Education). 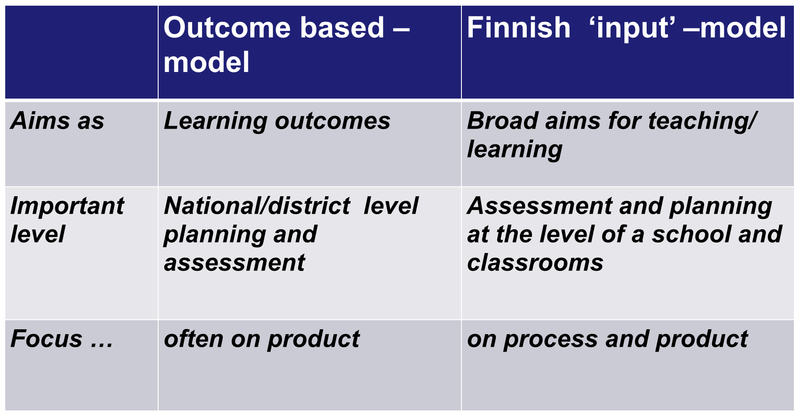 Upon reflection and constant discussion we identified three key lessons to learn from the Finnish Education system that are driven by the ‘input’ model shown below in Diagram 2, which is the pillar of their education system. The Finnish system focuses on a core curriculum developed by the government that is then interpreted and implemented by the districts and schools at a local level. Teachers are given the autonomy to craft their curriculum like an artist would craft a painting. 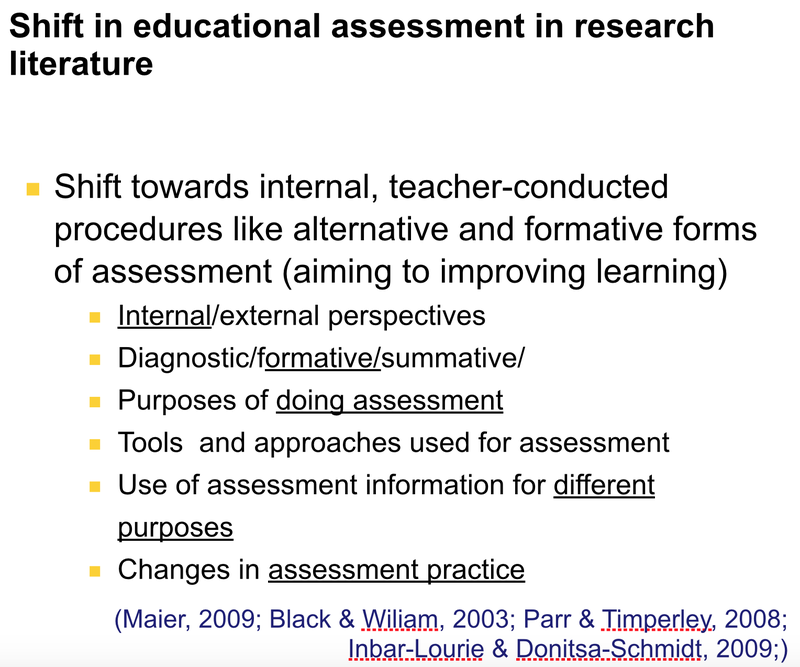 Furthermore, assessment is mostly formative designed at diagnosing student deficiencies, to focus on the teaching and learning process rather the product. Recruiting the best of the best – a teacher is a highly desirable profession amongst Finnish people. The number of places for teaching nationally in Finland is regulated by the government, so there is never an oversupply of teachers. Around 800 places are offered for education students nationally. Over 8,000 applicants apply for these positions. Higher results in the high school exit examination are needed to enter teaching than for engineering or medicine and interestingly the salary for teachers is in alignment with the national average. Teachers with expert knowledge – teachers are six year trained and complete a Masters Degree prior to commencing their teaching career. There are no alternative ways to receive a teaching credential. 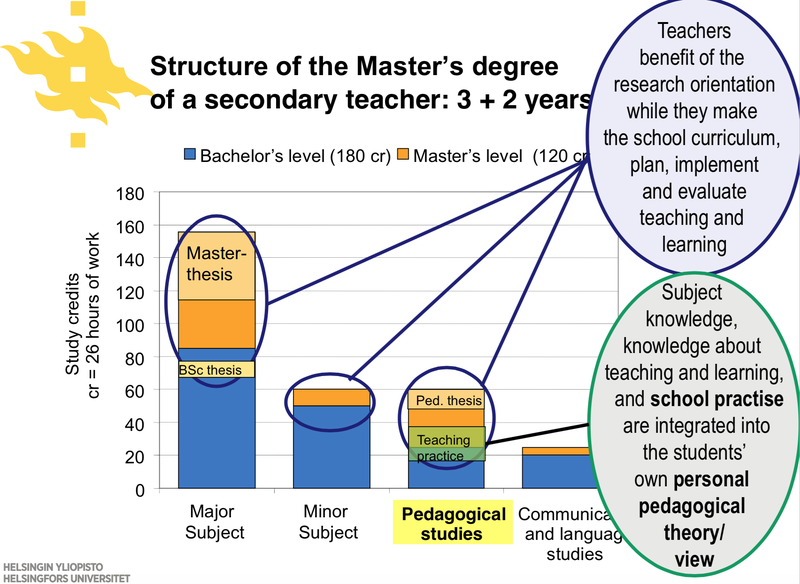 Diagram 3 shows the educational pathway for teachers who by the end of their training, will have completed three theses, a thesis in their undergraduate degree, a masters thesis and a thesis related to their pedagogical studies. The high quality of teachers equates to a high level of professionalism and teacher effectiveness. This leads to a high level of trust from the administrative bodies and less of a need to focus on teacher accountability. In recent years, Finland has made a significant shift in transferring the decision making and assessment to schools at the local level. This is in complete contrast to many other OECD countries who are favouring increased standardisation of curriculum, continual inspection and national testing. As a result, this shift has placed greater emphasis on teachers as professionals who are required to make important judgements on the length, breadth and depth of the curriculum that they teach, given the changing nature of their students. In each classroom that we visited, we witnessed teachers constantly formatively assessing students either by questions; online games, projects, rich tasks or online quizzes. This highlighted the shift in the role of the teacher as shown in Diagram 4, where the overarching aim of all teachers is to improve learning. The decentralisation of the classroom is not an easy task to undertake. However, the Finnish education system is based on ‘educational equality’, where they aim to minimise the influence of the social and economic backgrounds of the schools. 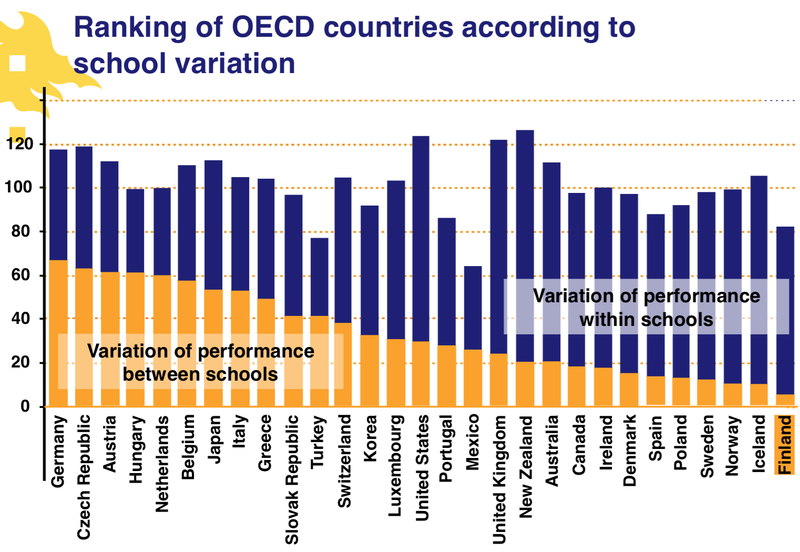 This is highlighted below by Diagram 5, which shows the ranking of OECD countries according to the variation of results within a school (Blue) and between schools (Orange). This graph demonstrates that Finnish schools are highly comprehensive; however, they have minimal variations between the schools. This shows that standardised testing of schools and subsequent rankings are not needed as schools and teachers are professionals focusing on the learning of all students. The excellent results achieved by Finland on the PISA assessment are remarkable and are a result of the autonomy and trust that teachers are given. 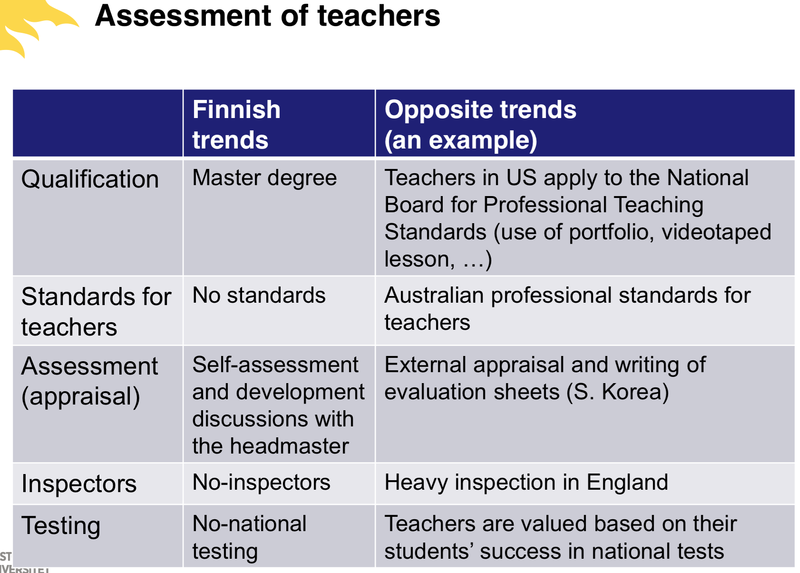 As many countries move towards increased accountability of teachers through standards, inspections and appraisals, Finland have moved away from these trends. The above diagram shows the disparity between professionalism and bureaucracy. In Finland they place trust in their teachers to know their students through collaboration, networking and partnerships. In contrast, many other countries are allocating resources to generate increased competition, nation-wide testing of students and subsequent school rankings. Furthermore, they do not rely on test-based accountability. Their system relies on the expertise and professionalism of the teachers who are committed to educating all students. As a result, the output of their system is trust and autonomy from quality teachers who undertake rigorous courses. Consequently, in Finland, there are no ‘standards’ for teachers to demonstrate, no external appraisals of teachers, no inspections of classes and no national testing of students. 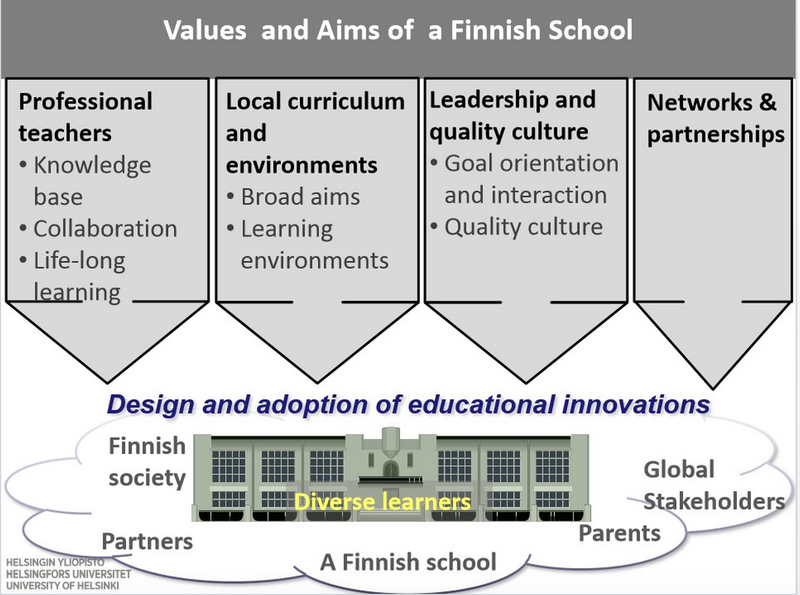 This is in alignment with the values and aims of a Finnish school shown below in Diagram 7. The removal of check measures in teaching has promoted a goal-orientated and quality focused culture within schools who are in the position to promote innovation through the building of networks locally and global partnerships. Whether it is coding, robotics, project based learning or other innovations, all teachers have the professional knowledge, trust and autonomy to adapt the way they teach to cater for the needs of 21st Century learners in a global world. We definitely have a lot to learn; however, it is all doom and gloom for the Australian education system. There is a growing movement of schools taking ownership at a local level to interpret how we teach, rather than focusing just on what we teach. Schools are attempting to move away from teacher-centered learning environments, to student-centred collaborative environments supported by appropriate technology. However, our professionalism needs to meet the needs of the 21st century, especially in terms of the graduates coming from university. Teaching is a profession, not a job and we need professionals to ensure that we gain trust-based responsibility from all stakeholders to make appropriate decisions at what is ‘best practice’ in teaching and learning. This will ensure that there is equality in the education of Australian students, especially in comparison to other students around the world. Gavin Hays (@gavhays) and Kurt Challinor. We would love to hear your thoughts on how our education system compares with Finland’s. Let us know what you think!